Did you know you can make popcorn easily on your stove? Just put the kernels and some oil in a pot with a lid, keep your heat down to medium-low, and you’ll have better-than-microwave popcorn! Mr. KitchenOperas and I are big popcorn fans. We’ll make a big bowl in the evenings, and munch away to cop dramas or action movies. When we first had the Chili/Lime combination on popcorn at one of our favourite bars, we just couldn’t stop eating it. So I had to try figure it out at home, and it’s been a house staple ever since. When I served this to our friend (and Best Man) Shaun, he exclaimed: “you made this?!? !” — so you know it’s good. Now all you have to do is pick the movie! In a heavy-bottomed saucepan with a lid, heat the oil & popcorn kernels together over medium-low heat, covered with a lid. After a couple of minutes, the popcorn will start to “pop”. Shake the pot a few times while the popcorn is popping. Once the popping slows down to about 3 seconds between pops, turn off the heat. 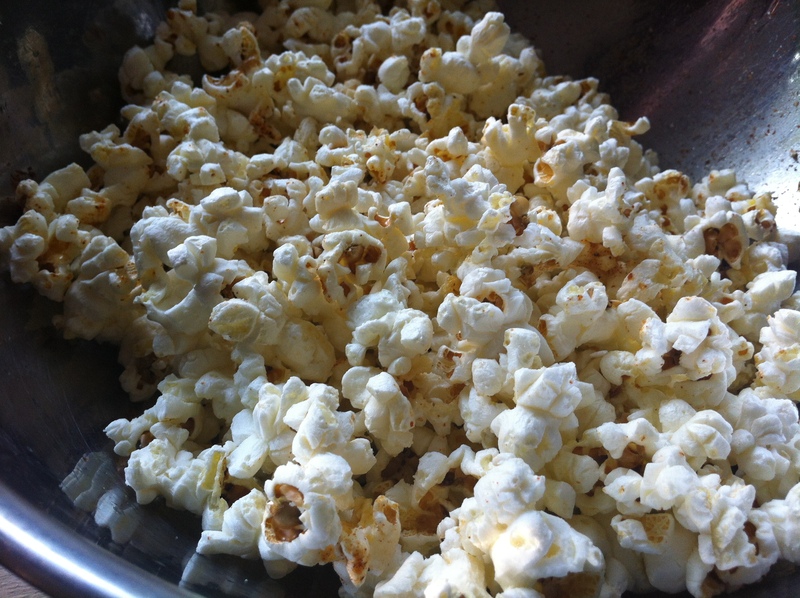 Dump the popcorn out into a large bowl, and sprinkle with the lime juice, salt, and chili flakes. Toss to coat the popcorn with the seasonings.